Where the Beatles were already looking down upon us on the front of Please Please Me, Robert Freeman’s cover photo for their second album appears to cast them in stone, or at least in oils; there is something almost ahuman about the four partially disembodied heads staring into space, somehow looking beyond us, or through us. Lennon resembles a sourly smiling statue, McCartney and Harrison look vaguely petrified; only Ringo, retaining his characteristic “bothered?” pose, gives us a link to touch. Otherwise they are already gods, if that was the intention. The album itself is more utilitarian and far closer to earth. It finds the Beatles carefully working out the consequences and implications of everything they’d set in motion; we’ve got here, they’re saying, now let’s try different things out – different styles of music, different ways of putting a song together - and see what fits our plans best. 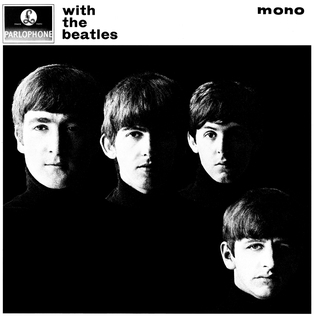 Frequently fumbling in its hopeful experimentations with song forms and structures – I stress that this is no bad thing - With The Beatles has become far better known for its cover versions than its originals; of the latter, only “All My Loving” has passed into The Canon. Although Lennon’s remains the dominant voice throughout With The Beatles – with Harrison a somewhat surprising second - it’s McCartney who is doing most of the musical stretching out. “All My Loving” brilliantly takes its run of guitar triplets and feeling of unrooted ecstasy from “Da Doo Ron Ron” and marries these to an express train swing of rhythm and the nascent spices of sixties optimism to underline exactly why the resultant smiling hope caught on with everyone waiting for their decade to begin (im)properly; whereas in 1962 Brian Hyland’s “Sealed With A Kiss” treated the summer vacation and associated postal-only relationship like the melting sword of doom, here McCartney is all grins and winks and furry faith – he’ll be back (as he promised on “A Taste Of Honey”) and he’ll bring the future back with him. Likewise, McCartney’s take on “Till There Was You” – originally sung in The Music Man but taking Peggy Lee’s 1958 samba-ish reading as its template – is a cunning opening out of capabilities; routinely used on occasions when they (and/or Epstein) felt they needed to placate the parents (in the 1963 Royal Variety Performance, for instance, to balance out “Twist And Shout” and its concomitant jewellery rattling), it reveals the first sighting of the placidly relaxed slacker which would become McCartney’s best known musical persona; he sits back in the song, like a comfy deckchair, and his carpet slipper grin (for example, on “They tell me!”) is happily palpable. Ringo has fun working out which way his bongos should be sitting, and George unfurls a much less nervous (though clearly still patiently and endlessly rehearsed) Spanish guitar solo. Note also that in The Music Man this song is sung by Marian the librarian – yet another example of the Beatles singing a song usually associated with women. As, of course, is their assault on “Please Mister Postman”; indeed, the latter segues splendidly out of “Till There Was You”’s lotus-munching contentment and wakes us up with a collective scream of “But WAIT!! !” It seems to me that, as with nearly everything else in the book not concerned with historical facts or technical details (in which terms it is naturally indispensable in relation to this part of the tale), Ian MacDonald in Revolution In The Head is missing the point when he wearily refers to the group’s suffocating wall of sound here; this is not a meticulous recreation of the Marvelettes but the fierce response of a frustrated group of Scouse misfits to the song’s emotional undercurrents of impatience and accumulated tension. In other words, the Beatles make this song work, scratchily, loudly and crudely (in the best possible sense) to a 1963 audience who mostly had never heard of the Marvelettes but would hopefully be encouraged by the performance’s Dexedrine-fuelled energy to investigate both Marvelettes and Motown further. Lennon’s vocal is especially anguished here, as it is on his reading of “You Really Got A Hold On Me”; again, his Strepsil rasp is most pointedly not how Smokey did it, but the confused desperation is intact in his increasingly anxious “hold me”s and especially his series of howls of “TIGHTER!” alternating with Ringo’s inspired rolls and fills. The Motown-style rallentando at the end is also inspired; though not on the Miracles’ original, it astutely points the way to other things in which the listener might be interested. It builds a bridge where none previously existed. Certainly Smokey and the Miracles continued to be Lennon’s main songwriting inspiration over this period; “All I’ve Got To Do” is an urgent modification of their various elements though its abrupt fade suggests a song not quite brought through to a logical end (as does its emotionally vacillating lyric). “Not A Second Time” organises and redeploys Miracles modes rather more successfully since Lennon uses Smokey’s characteristic chord changes and modulations (the same ones which were hailed at the time – in The Times, no less – as “Aeolian cadences”) to extend his own songwriting language; the song is an audacious construct whose middle eight is noticeably longer and more emphatic than its verses with bar line conventions ignored or overrun to accommodate a more conversational lyrical structure, fitting for a group who felt the need to talk to its audience as directly as possible. The album is full of life and elastic possibilities, even in its seemingly least promising corners. George’s very demure delivery of “Roll Over Beethoven” is hardly Chuck and the rhythm is noticeably squarer than that of the Chess house band but the lush rush of the new remains unavoidable; the old is done (“Rockin’ in two by two” as though fleeing to the Ark from the imminent flooding of restrictive history), the broom of now must sweep all behind it; they fumble the closing flurries behind Harrison’s “Dig to these rhythm and blues” but it just doesn’t matter - it fits with peerless imperfection. “Little Child” is practically thrash punk a generation ahead of SST, totally wiping out the rather creepy “little girl” fixation which had besotted not only their immediate Brylcreemed Britpop predecessors but also most of their peers (see for instance Wayne Fontana and the Mindbenders’ “She Needs Love,” recorded as late as 1965). Lennon’s harmonica and Ringo’s cymbals are locked in a race to drown each other out but Lennon’s arch “I’m so sad and lonely” pinpoints the group’s central appeal; here, finally, is empathy as opposed to self-pity or buried contempt and millions were only too happy (at one essential remove) to offer him their company. “I Wanna Be Your Man” was the one John and Paul polished off (very lightly and quickly) for the Stones and much has been made of the fact that they gave their own version to Ringo to sing; did they really think that little of it? Actually it’s a great performance, if scarcely the Stones – but then, why should it be? Its ferocious garage rock is highly entertaining, and Ringo (described as a “fierce-voiced drumming man” singing “a real raver” in Tony Barrow’s hilarious sleevenote, a period piece in itself, full of attempted alliteration [“Fourteen freshly recorded titles,” “these two remarkably talented tunesmiths”] and energetically trying expressions of inbuilt obsolescence [“gets away to a rip-roarin’ start,” “romantic balladeer,” “Much recorded by American blues merchants”]) keeps as straight and asexual a face as possible as the rest of the group yells and barks behind him. George sings “Devil In Her Heart,” a 1962 side by the impossibly obscure US girl group the Donays – one immediately visualises them thumbing through the latest R&B import 45s at the NEMS store of a Saturday lunchtime - with an admirable preservation of countenance given Lennon’s increasingly demented backing vocals (“SHE! JUST! DE! DE! VILL!” he ends up cackling in cod-Jamaican staccato tones; see also his similar slide into patois towards the end of “Please Mister Postman” with “DEE-liv-AH de let-TAH!”). “Hold Me Tight” was seen even by its authors as (in McCartney’s term) a “work song,” a throwaway. A leftover from the Please Please Me sessions reluctantly polished up for the second album, the song actually provokes some of the Beatles’ most adventurous structural moves - it starts, not at the beginning, but in the middle of the middle eight as though the tape operator had been delayed in the tram; its chorus climaxes in a wholly unexpected minor key falsetto; the words of the chorus flood casually into the structure of the middle eight, which in itself is rather sinisterly set, as evinced by Ringo’s unusually concentrated tom-tom work; and the song ends in a bold decelerando. The performance is hastily enthusiastic, John and Paul tossing a frisbee of hoarse between their voices (“Hello Franz Ferdinand!” exclaimed Lena at one point) – and this was simply (!) their idea of an album filler. Then there are the Lennon-led opening and closing tracks; first, the cleverly bouncy “It Won’t Be Long” with its elementary but extremely effective “be long”/”belong” wordplay and its less than elementary doo wop-derived major seventh ending, beaming a ray of hope so ripely radiant that its original inspiration – Little Eva’s “The Loco-Motion” – is barely apparent. Finally there is another “Twist And Shout”-style big finish/set closer with their rampage through “Money” where Motown gets violently jerked into early sixties Britain. George Martin’s (mostly electric) piano is throughout the album as discreet as ever (subtly indispensable on “You Really Got A Hold On Me” in particular) but his keyboards hold the chaos of “Money” together and indeed provide a strategic doorway as waterfalls of Lennon howls cascade into glittering piano glissandi. Ironic or not, this performance is an even more direct rejection/negation of The Past than “Twist And Shout”; here, messy and bleeding but unquestionably alive, is born The Sixties, Lennon on the make and taking every scream out of his exhausted tonsils – and in his hysterical responses, McCartney’s high register nearly outdoes him – to DEMAND a future, to STOP paying for the mistakes of others, to imbue cap-doffing Britain (and, eventually, JFK-mourning America – note the date when this album displaced its predecessor at number one) with the whitest of lights and the reddest of heats. As the band lunges from climax to climax Lennon takes Freddy Cannon one step closer towards Iggy with his ecstatic roars of “WOW YEAHHHH!!!! I WANNA BE FREE!! !,” McCartney squealing his delighted agreement behind, or alongside, him. We are the future but we are also in business. Yet perhaps the record’s most piercing pointer towards the future lies in “Don’t Bother Me,” the first George Harrison song to appear on a Beatles record; though barely rated as a song by Harrison himself, it does provide several startling indicators of things to come, and not simply the ennui which would become the predominant marker of the other end of the sixties; McCartney’s bass is hauling itself out of bass drum compliance, and both vocal delivery and musical arrangement would have been very much in place in the early nineties alt/indie rock scene. In particular, within Harrison ’s prematurely exhausted “so go away, leave me alone” and “I’ve got no time for you right now,” it is even possible to hear the embryonic strainings of Kurt. And maybe it’s this anti-light of doubt – these are going to be fab and gear times, but don’t forget the grotty – which already set the Beatles on a plateau higher than anything to which the likes of the Searchers or the Swinging Blue Jeans might ever have aspired. This wasn’t merely a matter of a Merseyside takeover – though the British 1963 number one singles list tells a more comprehensive story – but a provocation for awe and worship. Why are we so big, these statues seem to ask – but then again, aren’t we now looking at you on the same level? Ringo was always referred to as the 'short' one by the rest of the band, as Paul, George and John were the same height. Ringo was shorter, but only by four inches maybe, not the whole 'head and shoulders' the pic implies.